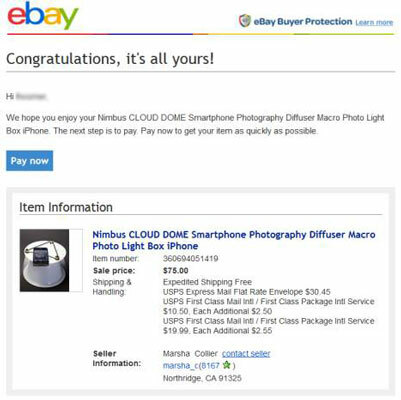 The Buy section of your My eBay page highlights the titles of items you’ve won or purchased and indicates the amount of your purchase price. If you think you may have won an auction and don’t want to wait around for eBay to contact you, check out the Buy section for yourself and find out whether you’re a winner. If you install eBay’s mobile app on your smartphone, it will also notify you of any transactional information. 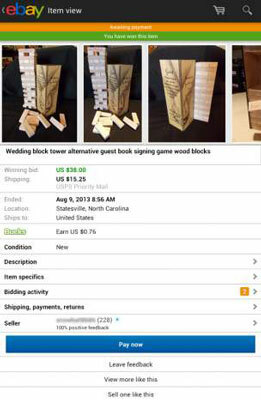 Throughout an auction’s bidding process, dollar amounts of items that you’re winning appear in green on your My eBay Bids/Offers page. If you’ve been outbid, the bid amounts appear in red. After an auction ends, there’s no marching band, no visit from a celebrity with a camera crew, no armful of roses, and no oversized check to duck behind. In fact, you’re more likely to find out that you’ve won the auction from either an eBay notification or by visiting the Won section of your My eBay page. (An item you bought outright through Buy It Now shows up in your Purchase History.) eBay gets its End of Sale e-mails out pronto, but there may be a bit of lag time if you’re not paying constant attention. The notification on the Android mobile app takes you to a page like that shown in the following figure. You will receive this as well as the e-mail notification.